It was the Show of Shows, the Spectacle of Spectacles. It’s still the largest amphitheater in the world, albeit fragmented and crumbling in its disintegration. 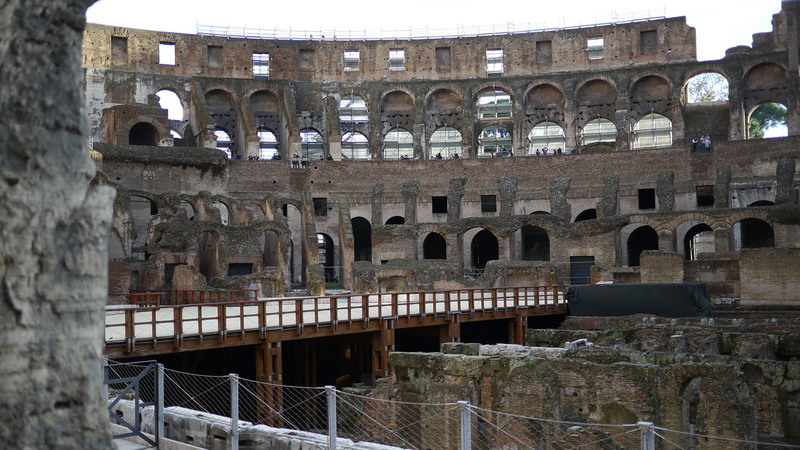 The Colosseum of Rome was a Really Big Show: a sprawling arena for theater, violence, death, and annihilation. Not unlike the Spectacles of today, in which men and women engage in the brutality of human conflict as sport; not at all unlike the political gamesmanship of today where men and women brutalize one another in assaults of power and arrogance; and finally, the Colosseum is the direct ancestor of reality television in which men and women punish one another with joy, vengeance, and cruelty. The Colosseum was the Show of human degradation, the greatest symbol of the ruin(s) of the Roman Empire, a symbol of ruinous brutality performed throughout human civilization. Is there a direct link between the Spectacle of the Show and the Empire of Ruin? No doubt there is. What you observe in the ancient fragments of the Roman Empire are the echoes of our own culture, the virus of politics that eats away and erodes contemporary culture. The now inert lumpen mounds of brick and stone at the Colosseum once supported a stage where animals ripped the bodies of slaves to shreds; where gladiators swung their swords in terrifying assault; where chariots crashed and burned; where emperors and their flocks looked on with satisfied grins and screaming cries for more blood. The Spectacles of today are also a grand Show of the worst of Man, the total abandonment of reason and civility, and an unquenchable thirst for pain and suffering. These are no doubt the ruinous ingredients of the epic denouement that inevitably eats away at every Empire at its apex of pride and hubris to deliver its Last Show, the Grand Finale, the one that brings the curtains, sets, and ceiling down in a crashing conclusion. Some day future cultures and civilizations will purchase tickets to tour our own crumpled monuments and ruinous arenas. I’ll begin right now working on the audio tour for that Show.